Humpback whales are the furthest-traveling mammals on the planet, capable of journeying some 3,000 miles a year as part of their annual migration. But all that swimming sure can tucker a whale out. Researcher Kieran Bown, of PangaMX, was on an expedition to the Caribbean Sea earlier this year when he and his group saw the tail of a humpback whale sticking up off in the distance. At first, they feared that the motionless animal might be injured or dead - but as they got closer, it became clear that the whale was actually just dead tired. 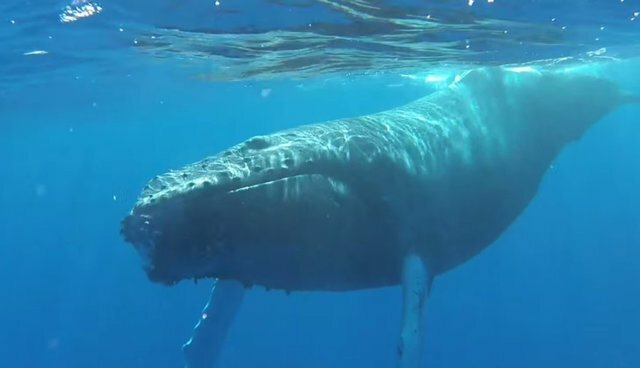 Bown, equipped with a GoPro camera, decided to enter the water to get a better look at the dozing whale. 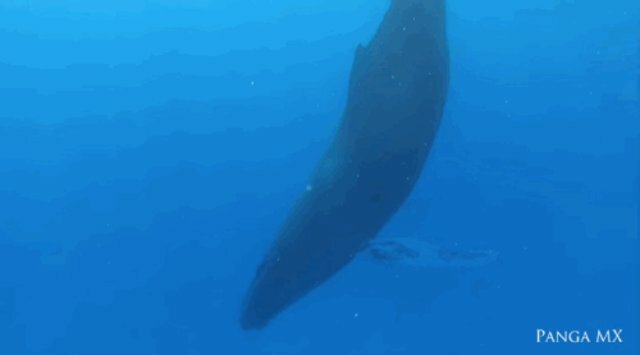 For about ten minutes the humpback continued to simply float tail-over-head without moving a muscle until finally she woke up - to take a breath. It was only then that the sleepy whale realized she was being watched. "The whale was coming up to breathe, with a slight movement of the fluke and twisting her body using the pectoral fins [...] she brought her head up right close to us as if to get a look at it," writes Bown. "I froze exactly where I was, I had never been approached by a whale before, only observed them as they swam by, it was as if she was checking us out." But apparently the sight of a few little humans lingering around her was not enough to disturb her from resting a little longer. After a few deep breaths at the surface, the whale resumed her up-and-down position and presumably went back to sleep. 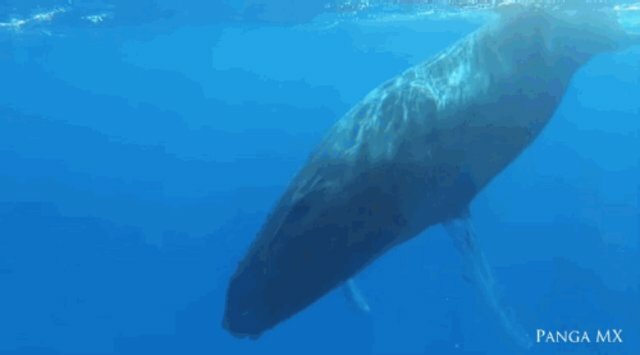 Whales typically sleep at night, which makes this a rare encounter - though other remarkable footage has been captured of sperm whales napping too, and as a group, no less. Unlike humans and other non-aquatic mammals, respiration is not involuntary for whales and dolphins. In order to keep from drowning as they sleep, these animals shut off half their brain at a time, allowing them to return to the surface periodically to breathe.